Who doesn’t love crispy fried shrimp? It’s such a quick and easy meal to throw together. I always keep a bag of frozen shrimp in my freezer, which makes serving this that much simpler. We are definitely shrimp lovers in our household, I know I’ve said that before. 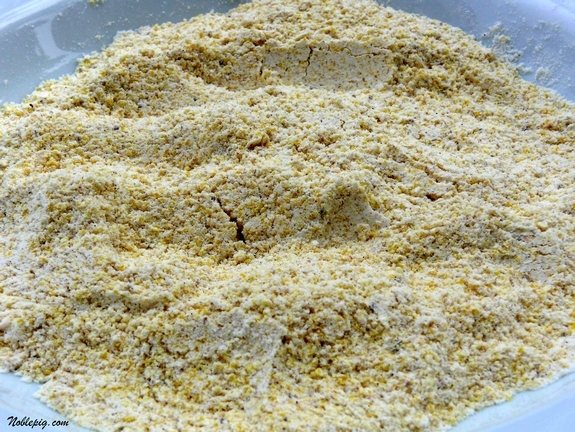 What I like about using cornmeal is the coating doesn’t become too thick and you can actually taste the shrimp and the seasoning as opposed to a mouthful of breading. My kids really appreciate this. I make up a quick tartar sauce and this is ready in no time. I have never tried this with fresh shrimp but I can’t see why it wouldn’t work. I hope you give this a chance, it couldn’t be better! In a shallow bowl, combine flour, cornmeal, salt and Old Bay Seasoning. In another bowl, lightly beat two eggs. In a skillet, cook the shrimp until golden brown and crisp in a 1/2″ of canola oil, about 3 minutes (about 5-8 at a time). Transfer to paper towel-lined plate to drain. Keep warm in a 200o F oven until all the shrimp are cooked. In a skillet, cook the shrimp until golden brown and crisp in a 1/2" of canola oil, about 3 minutes (about 5-8 at a time). Transfer to paper towel-lined plate to drain. Keep warm in a 200 degree F oven until all the shrimp are cooked. *I make up my own tartar sauce instead of using store-bought. For every 1/2 cup of mayonnaise I add, 1 Tablespoon fresh lemon juice, 2 teaspoons fresh minced onion, 1 teaspoon sweet pickle relish, 1 teaspoon horseradish and freshly ground pepper. YUM! Was just thinking of making shrimp for the kids! That being said, I’ve been making my fried shrimp this way, almost exactly, for decades now. It’s wonderful. We always have frozen shrimp too, it’s the quickest way to a meal as is often more fresh than what they are selling as “fresh”. Thanks for this recipe!! I have just discovered the beauty of cornmeal coating. I didn’t like it when I was younger – your children are much more advanced than I was at their age:) I can’t wait to try this – thanks for posting! Since I normally have a bag of Trader Joes frozen peeled and deveined shrimp with tail on in my freezer this will be a quick and easy dinner to get on the table during a weeknight, thanks! I love this! I imagine the cornmeal in the batter gives the shrimp such nice texture and flavor! This shrimp looks delicious. I am definitely trying your recipe. LOVE the Old Bay in the coating! 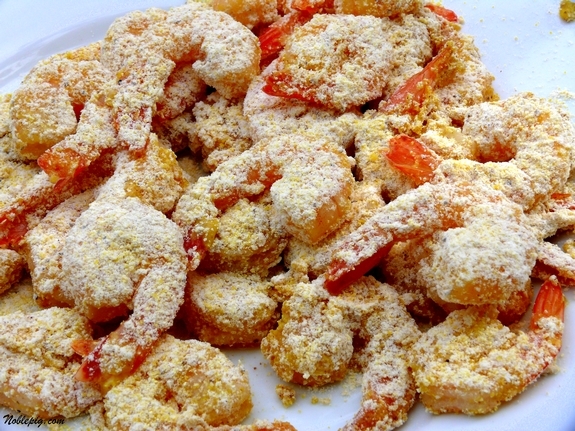 isn’t cornmeal the best for fried shrimp? love that texture. That looks really mouth watering Cathy. Really drooling here! Looks like the perfect shirmp dinner for shrimp loving households. Hey that’s the way we do it in Maryland, delicious! One of the greatest eating experiences (simple tho it is) on earth! And one of my favorites! YUM! Hi! This may sound silly…but the frozen shrimps you use are already cooked? no? I live in Ohio and I think frozen shrimp are the only option. This looks great, can’t wait to try it! Thanks! Cathy, This is what I love love about your blog. Recipes we can pull up and use the same day. You have shrimp in the freezer or another purchase from Costco like we all do. We dont have to find the “local fish monger”…….I live in KY excuse me. And you put a meal on the table that is fresh, tasteful and pleasing to the eye. You are the best….bring on the wine. Love, love, love these…so easy!! You make it so easy!! Meant to also say that your homemade tartar sauce sounds terrific, too! I love cornmeal shrimp!! bookmarking this recipe. Yes, Yes! We have fried shrimp quite frequently around here. Love ’em!! I have never made my own tartar sauce, though, and I will do as you do! Thanks for that tip. This sounds like a great way to prepare shrimp. Bookmarking! …you had me at “all you can eat” ha! Great, yummy recipe perfect for a party. Looks tasty! I just did a cornmeal crusted tilapia for fish tacos the other night and agree about cornmeal vs breading. I’ve had that coating on fish and love it. Perfect for shrimp..looks delicious! I love this one! And so will my hubster! I have a real weakness for crispy fried shrimp. I hate to think how many of these little gems I could put away. It does sound delicious Cathy… I can see why your kids would be huge fans. Crunchy shrimp sounds just delicious. The old bay in the corn meal is great too! Do you have an extra room? I just want to move in……..I’ll learn how to cap your bottles…pick grapes….everything you do looks DE-LISH! YOU ARE AMAZING!!!!! Do not know how you accomplish everything you do!!!!! Old Bay Seasoning is a blend of herbs and spices; mustard, paprika, celery seed, bay leaf, black pepper, red pepper, cinnamon, cloves, allspice, nutmeg, cardamom, salt and pepper. Just Google it and you’ll find out everything you wanted to know about it as well as how to purchase it. Oh these look yummy! I’ve never tried (or made, for that matter) anything with a cornmeal coating, but I certainly want to give it a try now. I’m also interested in trying out your tartar sauce recipe. Never thought of adding horseradish to it. Oh Yeah, this is PURE comfort food! I need me some of that!! 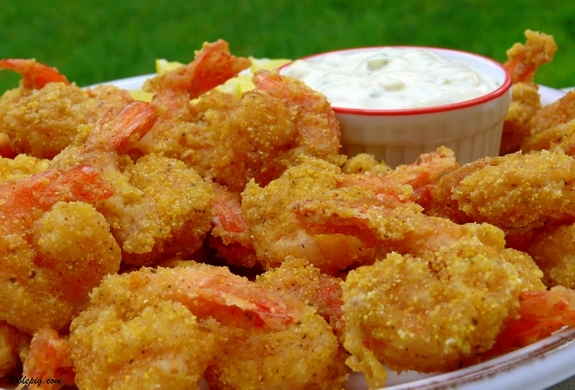 Cornmeal makes a fabulous coating doesn’t it and these shrimp look particularly delish! Oh Cathy, I could eat the whole plate of shrimp – they look amazing. My husband would LOVE these. I should make these for fun one night. I’m not a shrimp fan, but I bet that breading would be good on chunks of white fish! Now I want shrimp for dinner! I haven’t had it in months! Looks like an easy way to fix a favorite! I always have a couple of bags of frozen shrimp on hand, in two different sizes. The one I reach for most often is 21-25 (per pound), but I also keep 26-30 size for things like fried rice. Either would be great for your recipe, I think. Yummy crunchy shrimp! Love it! Okay, next time I bring up the deep fryer from my basement – this is going to be on the menu! I’ve never used cornmeal before – but what a great idea! These must be so super crispy, what a great treat. I keep forgeting to get pepperoni so that I can make those pepperoni puffs in your previous post. I wish I wasn’t the only person in my house that liked shrimp! I might just make these anyhow because they look SO good! And…I love that first photo. The colors just POP! 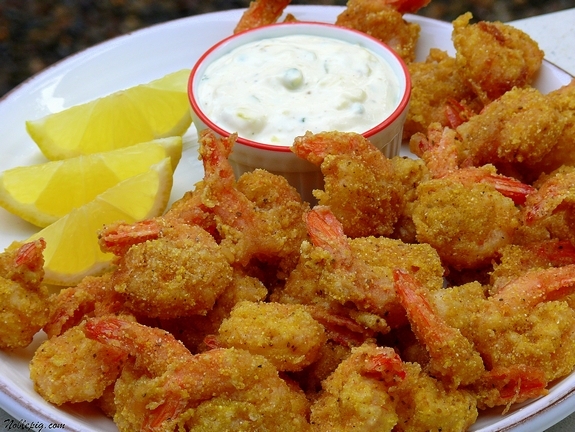 I love the idea of crunchy, succulent shrimp without deep frying. They look fabulous! This recipe is a keeper! Wow. Lucky, LUCKY husband. I want to marry you, your food and your delicious photography. Really a wonderful site that I stumbled upon. Please keep it up. Have you delved in any soups? I did a ramen from scratch, it’s truly daunting when done the traditional way.